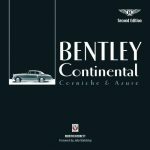 At the time period this book covers, Bentley cars were built by Rolls-Royce which had taken over Bentley Motors in 1931 in an attempt to thwart the competition and prevent Bentley from going to Napier which would have constituted an even more formidable challenge to Rolls-Royce. In terms of performance and coupled with suitable coachwork, these Bentleys—“The Silent Sports Cars”—were a considerable success in the marketplace, no matter their premium price. Walker, whose A–Z of British Coachbuilders ought to be on the bookshelf of anyone with an interest in British cars or coachwork in general, presents here his second title in publisher Herridge’s “In Detail” series. 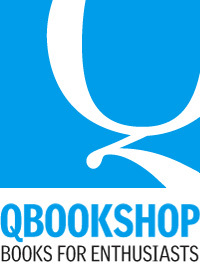 Charles Herridge’s previous imprint was Bay View Books, acquired by MBI in 1998, and he himself runs two Mark VI Bentleys. 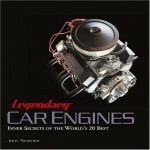 Happily, we have here both an author and a publisher with a track record of commitment to the classic car. 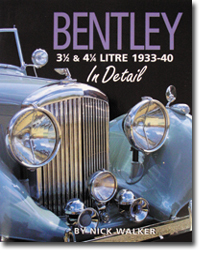 In recent years Derby Bentleys (so named after their place of manufacture, and thus distinct from the earlier Cricklewood and the later Crewe Bentleys) have seen brisk trade with solid price increases, and a new generation of custodians will welcome a book that offers a concise introduction to the marque’s beginnings, the 3½ and 4¼L models’ development, technical features, differences, and coachwork. Also described are the Mark V and experimental cars, i.e. the Paulin/Embiricos car and the Corniche. 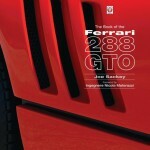 Chapters on using the cars on the road then and today, as well as advice on parts availability, maintenance, and preservation will not fail to make models seem desirable and survivable to the newcomer. Even readers already steeped in model and marque history will benefit from at least two aspects that are especially well articulated in Walker’s book. One is his detailed treatment of the acquisition/takeover of Bentley Motors by Rolls-Royce (a subject rife with controversy and too often glossed over by commentators), with particular emphasis on the subsequent internal tensions at Rolls-Royce in regard to model policy and product placement. Quotes from letters and memos illustrate abundantly a degree of infighting and spin doctoring that appears almost unseemly. 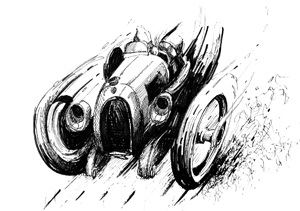 The other is Walker’s knowledge of other cars of the era (also evidenced in the fact that he is Librarian of the VSCC and Archivist of the Institute of Vehicle Technology), which enables him to present a rich field of context in which to see, and against which to measure, the 3½ and 4¼L Bentley. The book is generously illustrated. People familiar with the literature will note that many of the b/w period photos and drawings have (how could it be otherwise) been already seen before. But 70-odd color photos of some 14 cars in their present-day (restored and unrestored) state are obviously new to the record and of great interest—not the least in that they show certain aberrations from form which will rather irritate, and possibly confuse, the restorer whose goal is to-the-letter authenticity. Adaptations, modifications, matters of personal taste are not intrinsically “wrong” but it might have been useful to point these out, if only to school the reader’s eyes. Three Appendices list show cars, road test data, and competitor’s road test data. There is no Index.